Well, Eglantine (my car) had a dead battery this morning which really was no surprise. I canceled my two appointments and called AAA. 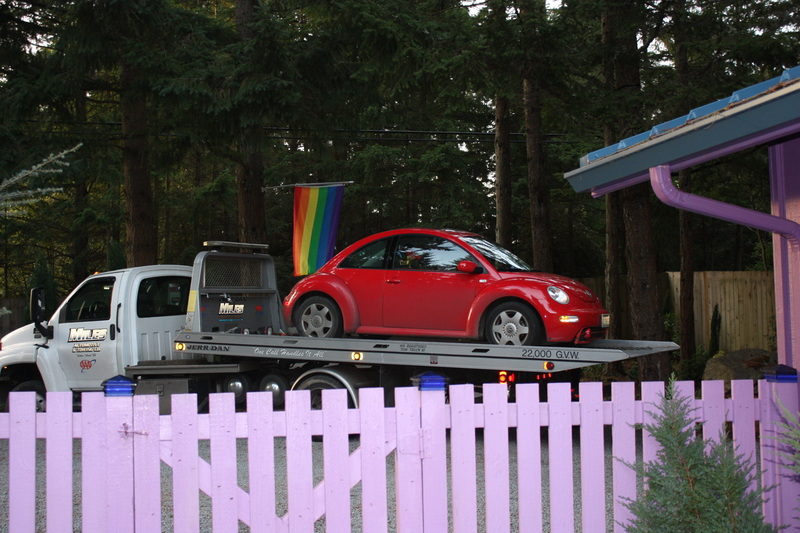 I was glad that I was home and not stuck on the road somewhere as the island’s tow truck was headed to Tacoma with another disabled vehicle and by the time the truck actually got to me it was 3:45PM!! But since I was inside warm and cozy it didn’t really matter. And the tow truck driver turned out to be a very nice guy who also works for my dog groomer and he had bathed my dogs this past Monday. Only on Vashon would the same guy take care of both my dogs and my car! My garage thinks that they will have Eglantine serviced, with a new battery and an oil change by Monday afternoon. Anyway, I puttered around the house, picking out some of the fabric I want to use on my next set of two quilts for Vashon Youth and Family Services, editing a friend’s story, making comments on my classmate’s postings in my online class, and reading more of the review book I’m currently enjoying. I also had one student to tutor. It has been a beautiful if cold day and I am looking forward to the weekend! Hope Eglantine is better soon! Thanks, Libby! If she got more exercise she wouldn’t need a new battery every winter, but she has a stay-at-home mom! I should get her back on Monday, all serviced and raring to go! How frustrating! I hope Eglantine is fixed soon. How did you choose that name for your car? Thanks, Lydia! And she should be back on Monday. If I drove more, her batteries would last longer, but there it is. She is nearly 13 years old and has just over 30,000 miles on her! I named Eglantine for three reasons: it is the name of Angela Lansbury’s character in Bedknobs and Broomsticks (an old Disney movie that I love) and I really like Angela Lansbury; in Shakespeare’s time it meant a red rose and I am an English major and she is red; and it seems a good name for a basically egg shaped car. And I guess I could also add that I just like the name! Have a lovely weekend!